A good document just to say. All the others are very possible but separating the members from supporters is a task that will need you to make big sacrifices. Remember Lesley Okudo started a membership drive and already had big names coming on board to be members. But that is were his problems with supporters started. What we need to do as a club is to first educate the supporters that the club will still belong to you as fans. Restructuring this great club is what we want as all of us want to be involved. One other thing that you have not seriously discussed is accountability. Manifestos are good and every candidate should have them. The problem s how do we ensure that they are implemented? And does the constitution as it is allow the officeholder to freely implement his/her vision? Why is none of the candidates talking about Gor starting a ladies team? I see a lot of potential in the country from our ladies and this can also assist to endear the other gender to our team hence increasing the fanbase. Its well and good to talk about membership drives. But how will you account for the money? Great Ideas very practicable much in in line with what bloggers have been advocating. But I may add even the teachers KNUT & KUPPET were given a very good deal but it was anchored of performance contract. Surely is that a priority right now, will it ever be a priority before we make CAF CL our very own, winning it year in , year out. Like I say do we commit resources to building a stadium so that we can face the likes of City Stars etc or use these resources to attract and keep good players and coaches and become a regional and continental force. And after that we have the World Club Championships whereby the winner of the CAF CL participates in. What are the achievements of the ladies teams of Barcelona, Madrid, Bayern Munchen, Juventus etc? How often do we hear about them. They with become another GM Sacco, GM Water,GM Lotto etc taking advantage of the GM Brand while adding very little to the growth of this Great Club. @ODUOR12, we need to have long, mid and short term goals. Winning the KPL, GOtv, CECAFA should be our short-term goals, having members instead of fans should be mid-term goals. Winning CAF CL and building a stadium, Club house etc should be our long-term goals. Same as having Gor Ladies team (Mathare has one) , or even a basketball and maybe handball team in future. Barca, Real etc have all these and they are part of sports club. Even Zamalek, Esperance, Al Ahli etc are actually sports clubs as opposed to soccer clubs. At times you aim for the Sun but land in the moon. 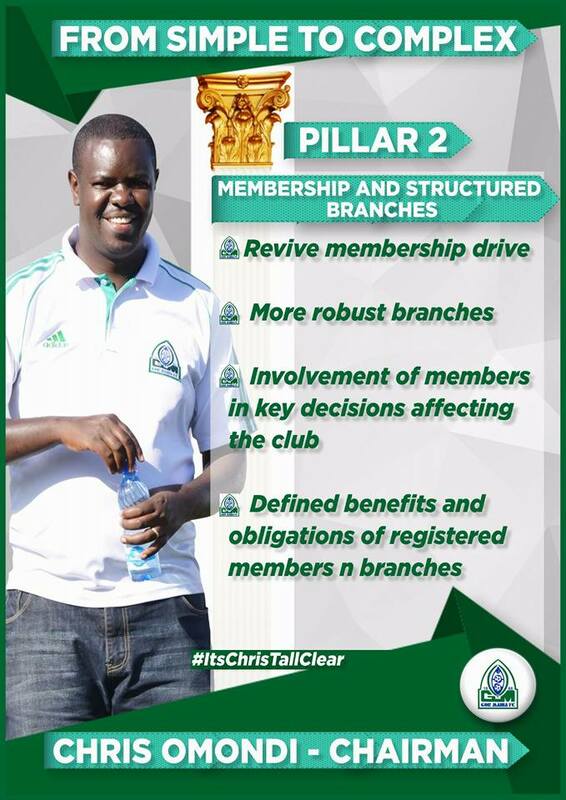 I actually would envisage Gor as an organised sporting giant in Kenya with a sports academy and a member’s club. Fans will always be there but when you have internal issues to sort out you always fall back to the members. Admin, it would really be good if the aspiring Chairmen could engage us on their manifestos and not just put them out here as if its “manna from heaven”. Is it possible to alert to them about existence of this site? We need clarifications, answers, timelines etc,etc @D.O don’t we run the risk of spreading our selves too thin and in the end achieving very little. Winning the CAF tournament etc is to me actually a short/mid term goal, winning them repeatedly long term goal but these require total commitment in terms of resources money and time. One thing that has put me off is “in the future”.In both articles.Even club gym iko kwa “in the future”.Some events should happen concurrently.We can have a south African company build us a stadium under BOP model.Am waiting for next aspirant. Got me a migraine reading it all. Solid but reads like a thousand others I have read before. Never saw light of day after the authors got to office.